I think we all know how important regular exercise is for both our physical and mental wellbeing. But it can still be really hard to fit in regular workouts when our lives are as busy as they so often are these days. If you’d like to start exercising a bit more, then here are 7 tips that might help you fit it in to a busy schedule. If you have a jam-packed schedule it can be incredibly hard to fit in a session or a class at the gym. Because you don’t just have to find the 30 minutes for the class in your day. You also have to factor in the time it’ll take to get to the gym and back. Working out at home, either with a DVD or by streaming a workout, can be much easier to fit into your day. If you’re trying to fit exercise into a busy schedule then you need to be able to just get stuck into it as quickly as possible. So you need to find the best time of day for you when you feel most keen to workout so you don’t waste valuable time dragging your feet before you get started. If might be that setting your alarm half an hour earlier in the morning and getting out of bed to exercise first thing is the best option for you. Or you might find that a 30 minute gym class on your lunch break works best for you and gives you an energy boost for the afternoon. If you can’t fit in a formal workout then you can still get more exercise in your day by walking more. The standard advice is to aim for 10,000 steps a day and getting something like a fitbit can really help keep you motivated to try and reach that target. You can add to your step count by walking round town in your lunch hour, or doing the classic things like parking a bit further away from work or the shops so you have to walk that little bit more. If you work in an office you can also do little things like walking to a colleague’s desk or office for a chat rather than emailing them, and taking the stairs to the toilets on another floor when you need to go. Another tip for those who can’t fit a whole exercise session in to their busy day. Set an alarm to remind you to get up from your desk on a regular basis and move around a bit. Take a walk to the staff kitchen on a tea/coffee run. Or even just do a few stretches at your desk. If you’re at home then you have a bit more freedom to do something like walk/run up and down the stairs a few times. Or do a quick circuit of sit ups and push-ups. Whether it’s at the weekends if you’re out at work during the week, or vice versa, make time with your children a chance to fit in some exercise. If your children are still little then pushing them in the buggy to the local park is a great way to get your body moving. When they’re older you can play games like ‘it’ and hide and seek with them, or do a few laps of the playpark while they’re busy playing. Another solution for busy parents is to actually include your children in your workout. 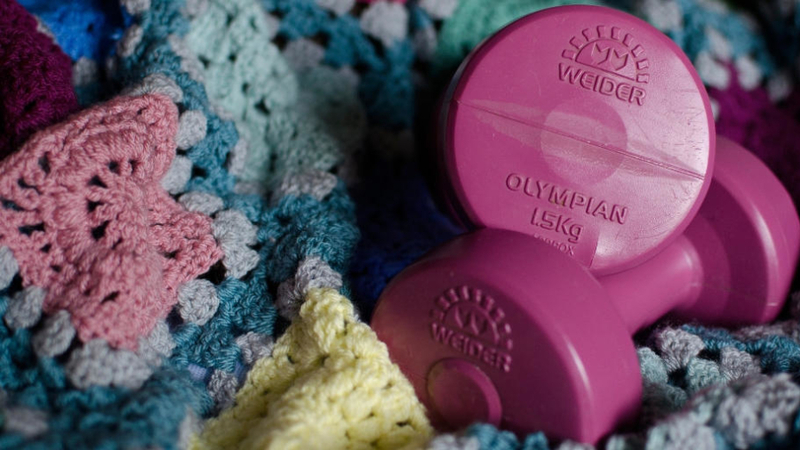 Babies and toddlers can be brought along to a buggy fit exercise class, or you can use their weight as extra resistance by babywearing while on a brisk walk. Another option is to find a gym with a creche where they can play while you workout. And older children can be encouraged to work out with you, either by playing sport together, finding a family friendly yoga class or seeing if your local parkrun session offers a junior option. Another great way to fit exercise into your everyday activities is to step things up a gear when you tackle the housework. Set a timer and move quickly to tidy, dust and hoover the house. I think the thing to keep in mind is that exercise doesn’t have to just mean a full-on session at the gym or a 5k run. Those things are great and hopefully some of these tips will help you fit them in once a week, but they’re not the be all and end all of exercise. If you really don’t have time to fit something like that in to your life then making other parts of your routine, like doing the housework and playing with your children, more active will still have so many benefits to your health and wellbeing. 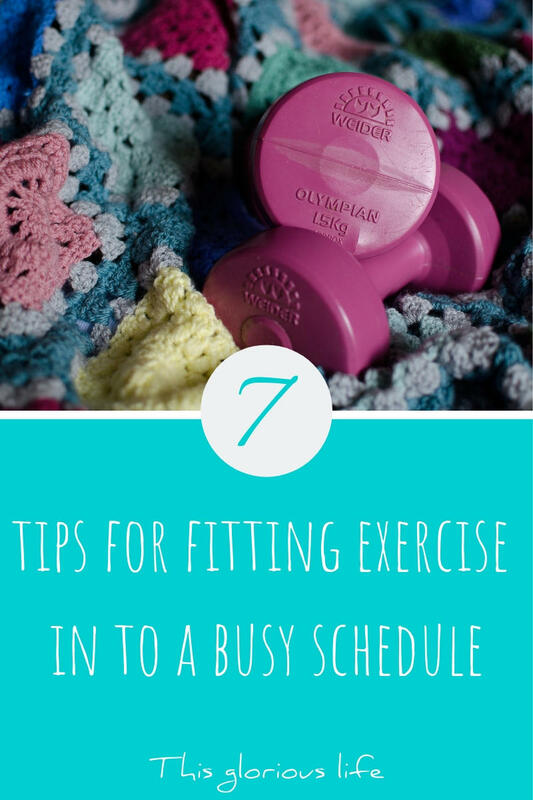 Do you have any other tips for fitting exercise into a busy schedule?